Assigned to radar picket station off Okinawa Aaron Ward successfully engaged the first two kamikaze attacks splashing both aircraft without incurring any damage to the ship A third and more determined intruder was detected as he commenced a diving attack on Aaron Ward. ... Despite being repeatedly struck by antiaircraft fire, the plane pressed home the attack. Just before crashing into Aaron Ward's superstructure, he released a bomb which smashed through her hull below the waterline, exploded in the after engine room flooding the after engine and fire rooms, rupturing fuel tanks, and severing steering control to the bridge. The rudder jammed, and Aaron Ward turned in a tight circle while slowing to 20 knots. ... Topside, the plane itself spread fire and destruction through the after deckhouse area and caused mount 53 to lose all power and communication. Worse yet, many sailors were killed or injured in the crash. ... Aaron Ward suffered further woe when another plane from an attack group selected her as a target and began its approach from 8,000 yards. Fortunately, the ship scored early hits and managed to destroy the attacker before he could inflict further damage to the ship. Another enemy then attempted to crash into the ship, but was splashed by antiaircraft fire. Soon after the two successes however, two more Japanese planes approached on her port bow. Though chased by American fighters, one started a diving run on Aaron Ward aiming at the bridge. Heavy fire from the ship forced him to veer to the after portion of the ship. Passing over the signal bridge, he carried away halyards and antennae assemblies smashed into the stack and splashed close aboard. Quickly on the heels of this attack, another intruder made a run on Aaron Ward. Coming in just forward of her port beam, he met a hail of antiaircraft fire but released a bomb before crashing into the main deck. The bomb exploded close aboard to port , with fragments showering the ship and blowing a large hole near the forward fireroom. ... As a result, the ship lost all power and gradually lost headway. At this point still another unobserved enemy aircraft crashed into the ship's deckhouse causing numerous fires and injuring and killing many more crewmen. ... As if that were not enough, Aaron Ward had to endure two more devastating crashes before the action finally ended. ... At about 1921 a plane glided in steeply on her port quarter. The loss of power prevented any of her 5-inch mounts from bearing on the target, and he crashed into the port side superstructure. Burning gasoline engulfed the deck, 40- millimeter ammunition began exploding, and still more heavy casualties resulted. 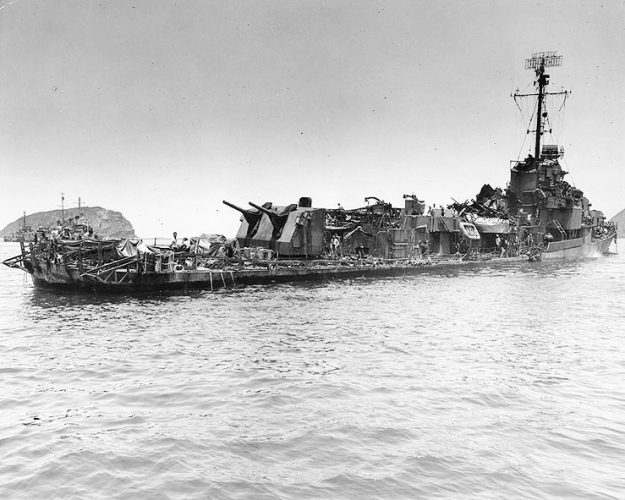 The warship went dead in the water, her after superstructure deck demolished. ... While damage control crews fought the fires and flooding, Aaron Ward began to settle in the water and took on a decided list to port. ... Aaron Ward still had one more ordeal to endure. Just after 1920, a final bomb-laden tormentor made a high-speed, low-level approach and crashed into the number 2 stack with the ensuing explosion blowing away the stack, and two gun mounts. Through the night, her crew fought to save the ship. ... Forty-two crewmembers were killed during the May 3 attacks.